Being sold on behalf of the Burge Estate. 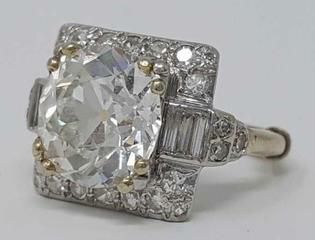 This amazing ring is part of the multi-generational estate of 2 prominent Macon and Atlanta families. You can inspect the items Sunday, March 3 and Thursday, March 8 during the hours of 11:00 A.M. to 3:00 P.M. Location: 2381 John Glenn Drive 108, Atlanta. The auction is online bidding only and is now open and the deadline for bidding is Sunday, March 11 at 3:00 P.M.
We use a dynamic / staggered closing. If an item receives a bid within 3 minutes of closing, that item will be extended for 3 more minutes and will remain open as long as bidders are placing bids in 3 minute intervals. You must register to bid on the auction. To register go to the “Click Here for Online Bidding” button. At the top of this page click “Register to Bid” and fill out the registration form. A credit card is required for registration. Please make sure your registration address matches the billing address for your credit card. If you place a bid in the auction, our merchant service will validate your credit card by placing a $1 hold. This is a hold only and will removed when the auction ends. Payment in the form of Bank Wire Transfer will be required for for the winning bidder. PAYMENT: Bank Wire Transfer only for the auction.